Although distinct patterns of homeobox (HOX) gene expression have been described in defined cytogenetic and molecular subsets of patients with acute myeloid leukemia (AML), it is unknown whether these patterns are the direct result of transcriptional alterations or rather represent the differentiation stage of the leukemic cell. To address this question, we used qPCR to analyze mRNA expression of HOXA and HOXB genes in bone marrow (BM) samples of 46 patients with AML and sorted subpopulations of healthy BM cells. These various stages of myeloid differentiation represent matched counterparts of morphological subgroups of AML. To further study the transcriptional alterations of HOX genes in hematopoiesis, we also analyzed gene expression of epigenetic modifiers in the subpopluations of healthy BM and leukemic cells. Unsupervised hierarchical clustering divided the AMLs into five clusters characterized by the presence of prevalent molecular genetic aberrations. Notably, the impact of genotype on HOX gene expression was significantly more pronounced than that of the differentiation stage of the blasts. This driving role of molecular aberrations was best exemplified by the repressive effect of the PML-RARa fusion gene on HOX gene expression, regardless of the presence of the FLT3/ITD mutation. Furthermore, HOX gene expression was positively correlated with mRNA levels of histone demethylases (JMJD3 and UTX) and negatively correlated with gene expression of DNA methyltranferases. No such relationships were observed in subpopulations of healthy BM cells. Our results demonstrate that specific molecular genetic aberrations, rather than differentiation per se, underlie the observed differences in HOX gene expression in AML. Moreover, the observed correlations between epigenetic modifiers and HOX ex pression that are specific to malignant hematopoiesis, suggest their potential causal relationships. The clustered homeobox (HOX) genes encode a large family of transcription factors characterized by the presence of a highly conserved nucleotide sequence called the homeodomain. This 61-amino-acid helix-turn-helix domain is responsible for the binding of HOX proteins to their target DNA sequences. In humans, the 39 HOX genes are organized into four genomic regions (the HOXA, B, C and D clusters) located on four chromosomes (chromosomes 7, 17, 12 and 2, respectively). Each cluster consists of 9 – 11 genes arranged in the same orientation and in paralogous groups ,. HOX genes play essential roles during embryogenesis by controlling cell fate along the anterior-posterior axis and specifying segment identity -. The characteristic expression of HOX genes can also be detected in various adult tissues ,. During hematopoiesis, the highest expression of HOX genes occurs in the stem and early hematopoietic progenitor cells. During maturation, HOX expression gradually decreases, and it is minimal in differentiated hematopoietic cells ,. The expression of HOX genes throughout the maturation of hematopoietic cells is tightly regulated, suggesting that disruption of this regulation contributes to the process of malignant transformation. The oncogenic potential of HOX genes in leukemia has been intensively studied for more than two decades. Several chromosomal translocations in leukemia involve HOX genes either directly (e.g., NUP98-HOX fusion) or via their upstream regulators (e.g., MLL rearrangements) -. Moreover, the overexpression of certain HOX genes and their cofactors are known as poor prognostic markers in leukemia patients -. The overexpression of HOX genes is believed to induce myeloproliferation, which together with additional aberrations, may lead to leukemia. The regulation of gene expression during hematopoiesis is controlled by the cooperation of transcription factors and the dynamic architecture of chromatin. The specific epigenetic landscape influences target gene accessibility. As major executors of epigenetic regulation, chromatin-modifying enzymes mediate DNA and histone modifications responsible for the unique dynamics of chromatin observed throughout hematopoiesis. The deregulation of this process likely contributes to the malignant transformation of hematopoietic cells. In embryogenesis, spatio-temporal expression of HOX genes is regulated by the trithorax-group (TrxG) and polycomb-group (PcG) proteins. PcG genes maintain HOX gene silencing through methylation of histone 3 lysine 27 (H3K27). In contrast, TrxG genes are responsible for maintaining previously established HOX gene expression through trimethylation of histone 3 lysine 4 (H3K4) ,. A similar effect of PcG and TrxG genes has been proposed in the regulation of HOX gene expression in hematopoiesis as suggested by the severe defects of hematopoietic cells that have been reported in PcG and TrxG knock-out models ,. In addition, the H3K4 demethylase LSD1 and JmjC-domain-containing H3K27 demethylases JMJD3 (KDM6B) and UTX (KDM6A) have been shown to contribute to HOX gene regulation in embryonic development ,. LSD1 establishes an inactive chromatin configuration by H3K4 demethylation, whereas JMJD3 and UTX activate chromatin by demethylation of H3K27. Finally, DNA methylation has been shown to participate in the establishment of HOX gene expression patterns, further supporting the role of epigenetics in the regulation of these genes . In this paper, we sought to determine whether the pattern of leukemic HOX gene expression was primarily driven by the differentiation stage of hematopoietic cells or determined de novo during the process of malignant transformation. To approach this question, the expression patterns of the HOX genes were correlated with the molecular genetics and morphological characteristics of the leukemic cells of patients with childhood acute myeloid leukemia (AML). To further study the regulation of HOX gene expression, we also examined the relationships of chromatin modifiers and HOX genes in normal and malignant myelopoiesis. Subpopulations of healthy BM representing developmental stages of hematopoiesis were sorted from the samples of healthy volunteers or minimal residual disease (MRD)-negative leukemia patients in long-term complete remission (Fluorescence Activated Cell Sorter (FACS) Aria, BD, San Jose, CA, USA). The combination of surface markers that was used to identify the particular stages of myeloid lineage differentiation is listed in Table 1. To ensure adequate analysis sensitivity, we pooled the sorted samples of each subpopulation from five control donors and processed them as described below. Main characteristics of stages of myeloid lineage differentiation – surface markers and their counterparts with morphological subtypes of AML. In total, 46 patients with childhood AML enrolled in the study were diagnosed and treated from 1998 to 2010 at the Czech Pediatric Hematology Working Group centers (Additional file 1: Table S1). Following the University Hospital Motol ethical committee's approval number P304/12/2214 and written informed consent, mononuclear cells were isolated from the diagnostic BM samples using a density gradient medium (Ficoll-Paque Plus, GE Healthcare Life Sciences, Uppsala, Sweden) and stored at −80°C. RNA from both the patient samples and the healthy donor BM subpopulations were isolated with RNeasy Mini Kit (Qiagen, Hilden, Germany) and transcribed to cDNA using the iScript kit (Bio-Rad, Hercules, CA, USA). The quantification of gene expression was performed using the iCycler iQ System (BioRad, Hercules, CA, USA). The primer design and qPCR conditions for amplification of the HOXA and HOXB genes in the sorted populations (HOXA3, A4, A5, A6, A7, A9, A10, B2, B4, B5, B6, and B7) and patient samples (HOXA1, A3, A4, A5, A6, A7, A9, A10, A11, A13, B1, B2, B4, B5, B6, B7, B8, and B9) as well as the chromatin modifier genes (PcG family: EZH2 and BMI1; Trx family: MLL; DNMTs: DNMT1, DNMT3a, and DNMT3b and histone demethylases: JMJD3, UTX and LSD1) were performed as previously described ,,,-. To normalize the gene expression levels, we used the ABL1 gene, which is known to be stably expressed during the development of myeloid lineage cells. The mutation statuses of the NPMI, NRAS, KRAS, CEBPa, c-KIT and FLT3 genes were determined in 12 patients for whom material was available and who were negative for the presence of the four major molecular aberrations (Additional file 1: Table S1). The analysis was performed by qualitative PCR followed by the sequencing of particular amplicons with the primers and PCR conditions as described earlier -. Data were analyzed using the statistical software packages Prism (GraphPad, La Jolla, CA, USA), Excel (Microsoft Corporation, Redmond, WA, USA), StatView (SAS Institute, Cary, NC, USA) and R-project (Vienna, Austria). The statistical significance of the differences among the subgroups of samples was assessed using non-parametric tests (Mann–Whitney and Kruskal–Wallis tests with Dunn’s multiple comparison post test). Gene expression correlations were estimated by Spearman’s rank correlation. Unsupervised hierarchical cluster analysis (HCA), performed with the Genesis software (Institute for Genomics and Bioinformatics, Graz University of Technology (IGB-TUG), Graz, Austria), was used to identify the subgroups of samples with similar gene expression patterns. Using FACS, we obtained eight subpopulations of normal BM donor cells, based on characteristic surface markers, which represent distinct stages of myeloid differentiation. The subpopulations corresponding with particular maturation stages were selected based on our expertise and previously published studies (Table 1) -. Notably, we frequently observed the asynchronous expression of antigens and the overlap of immunophenotypic maturation stages in the leukemic blasts. To better demonstrate the dynamics of HOX gene expression throughout hematopoiesis, data from the subpopulations of the two developmental lineages of myelopoises (granulocytic and monocytic) with the parallel differentiation stage were pooled together. This resulted in the discernment of four consecutive stages of myeloid development (stage 1 = G1 + M1, stage 2 = G2 + M2, stage 3 = G3 + M3 and stage 4 = G4 + M4). 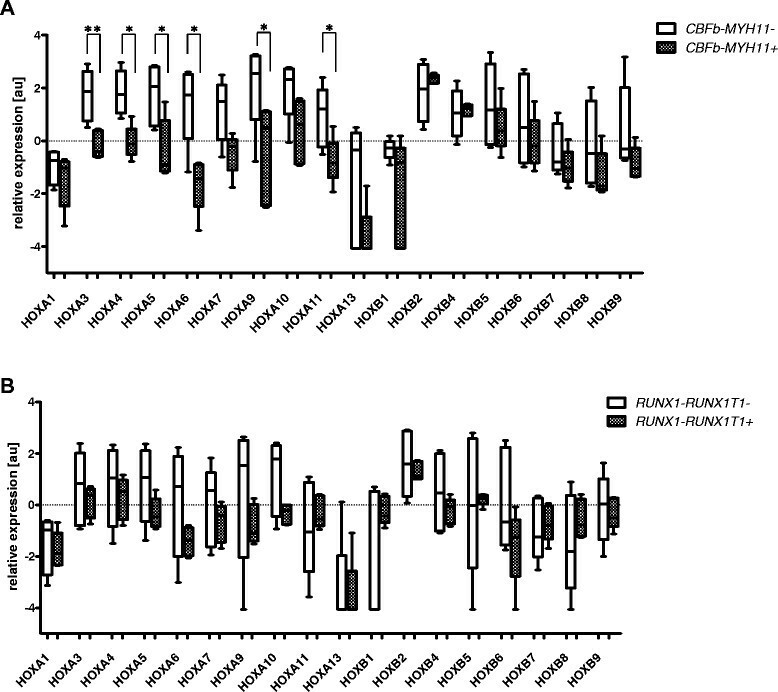 In accordance with previously published data, the expression of HOXA and particular HOXB (HOXB2 and HOXB4) genes gradually decreased during myeloid maturation (Figure 1A and Additional file 2: Figure S1). As assessed by comparisons on an one-to-one basis we also observed a clear positive correlation of HOX gene expression within HOXA cluster and HOXB cluster as well as between both clusters (Additional file 3: Figure S2). Expression levels of HOXA and HOXB genes in subpopulations of healthy BM and samples of patients with AML. A. four consecutive stages of myeloid lineage differentiation; B. morphological subgroups of AML patients; C. subgroups of AML with typical molecular aberrations. Distinctive HOX gene expression patterns were observed among the French-American-British classification (FAB) AML subtypes (Kruskal-Wallis test: p < 0.0001 for the HOXA and p = 0.0016 for the HOXB cluster; Figure 1B and Additional file 4: Figure S3). The M3 FAB subtype had the lowest levels of HOXA and HOXB gene expression compared with other FAB subtypes (see Additional file 4: Figure S3). In contrast, AML M5 had the highest HOXA gene expression levels, along with the largest number of individual HOXA genes showing significant differential expression (Additional file 4: Figure S3). Significant differences were also found among subgroups defined according to molecular genetics (i.e., Kruskal-Wallis test: p < 0.0001 for the HOXA and p = 0.0001 for the HOXB cluster; Figure 1C and Additional file 5: Figure S4). Patients with PML-RARa fusion showed the lowest levels of HOXA and HOXB gene expression, while those with MLL rearrangements expressed HOXA genes at the highest levels (the majority of individual HOX gene comparisons revealed significant differential expression in the PML-RARa and MLL+ patients, respectively). Moreover, unsupervised hierarchical clustering based on HOX expression divided the leukemias into five main clusters characterized by the presence or absence of prevalent gene rearrangements, i.e., PML-RARa, RUNX1-RUNX1T1(AML1-ETO), CBFb-MYH11 and MLL alterations (Additional file 6: Figure S5). Interestingly, three patients from cluster 1 (i.e., those having the overall highest levels of HOX gene expression and absence of these translocations) harbored a mutation in the NPM1 gene, similar to what has been reported in adult AML . High risk (HR) patients expressed HOXA genes at significantly higher levels compared with patients who were assigned to the standard risk (SR) group (p < 0.0001 for HOXA3 - A13 and p = 0.0004 for HOXA1). However, no differences were observed in HOXB expression between high and low risk patients. In addition, both HOXA and HOXB gene expression were not found to be related to the patient age or risk stratification (Additional file 7: Figure S6; risk group stratification of childhood AML (AML-BFM 98 and 2004): standard risk - FAB M1/M2 with Auer rods, M3, M4eo, Down sy, t(8;21), t(15;17), inv(16), and ≤ 5% of blasts in BM at D15 (except M3); high risk - others). The effects of genetic aberrations on HOX gene expression were even more apparent when analyzed within the morphological FAB subtypes. In AML M4, the CBFb-MYH11+ patients exhibited statistically significant levels of lower HOX expression compared with those lacking the rearrangement. For AML M2, the RUNX1-RUNX1T1+ patients tended to show reduced levels of HOX gene expression compared with patients without the rearrangement (Figure 2A and 2B; p values indicated in figure legend). Differing HOX gene expression levels observed in FAB subtypes with respect to the presence of typical molecular aberrations. A. CBFb-MYH11+/− patients with AML M4. Asterisks indicated statistical significance (* ≤ 0.05, ** ≤ 0.01; additional borderline significance: p = 0.0679 for HOXA7, HOXA10 and HOXB9, p = 0.0732 for HOXA13); B. RUNX1-RUNX1T1+/− patients with AML M2. Asterisks indicated statistical significance (* ≤ 0.05, ** ≤ 0.01; additional borderline significance: p = 0.1745 for HOXA5, p = 0.1745 for HOXA9 and P = 0.1172 for HOXA10). In adults with normal cytogenetic AML, NPMI1 mutations are associated with high HOX expression and those leukemias have a higher frequency of FLT3 mutations . In our samples, HOX gene expression in the PML-RARa+ patients remained at very low levels regardless of the presence of FLT3/ITD mutations (FLT3/ITD+ (N = 4) vs. FLT3/ITD- (N = 4); Figure 3A; p values indicated in figure legend). In contrast, in the absence of a PML-RARa fusion, HOX levels were higher when FLT3 was mutated. These results were further emphasized by the analysis of gene expression data from a larger (N = 48) independent cohort of FLT3/ITD+ childhood AML patients , which demonstrated that HOXA and HOXB gene levels were significantly reduced in FLT3/ITD+ patients with PML-RARa (N = 12) compared to those without the fusion gene (N = 36; Figure 3B). Differing HOX gene expression levels observed in PML-RARa + patients with respect to the presence of FLT3/ITD . A. HOX gene expression in the subgroup of PML-RARa+ patients with FLT3/ITD compared to the other PML-RARa+ patients. Asterisks indicated statistical significance (* ≤ 0.05, ** ≤ 0.01; additional borderline significance: p = 0.0833 for HOXA7); B. HOX gene expression levels in FLT3/ITD+ patients with PML-RARa compared to the other FLT3/ITD patients. 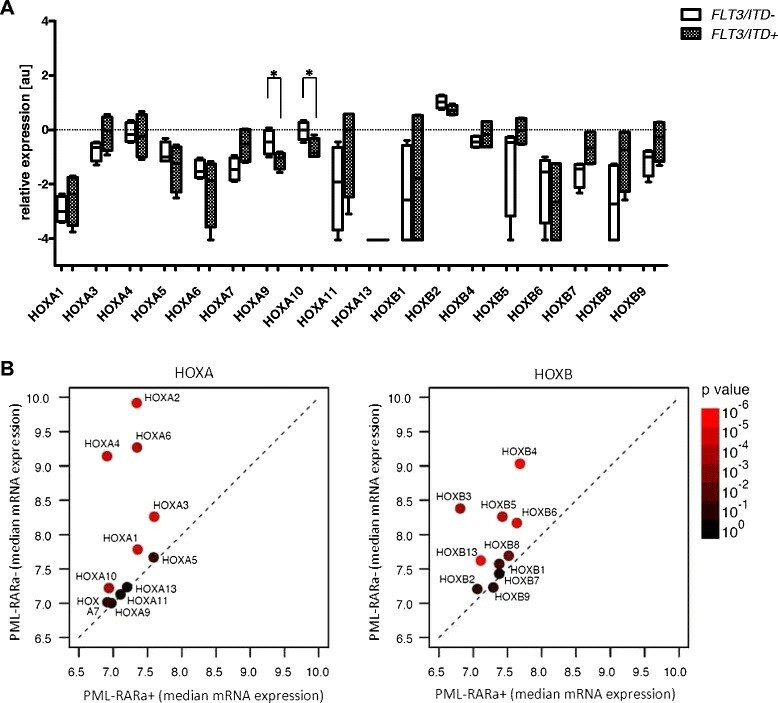 Median expression (log2) of HOXA (left) or HOXB genes is indicated by bullets colored according to p values (Mann–Whitney tests) of differences between PML-RARa + and other groups. Color legend indicated at right. Dashed line indicating equal expression is also provided. As indicated above, we sorted the subpopulations of normal BM cells from the healthy donors according to the specific stage of myelopoiesis. Our gating strategy enabled a comparison of these subpopulations with the FAB subtypes of AML patients exhibiting the similar stage of myeloid maturation arrest. The list of AML subtypes assigned to particular stages of myelopoiesis is provided in Table 1. Differential HOX gene expression patterns were identified between the normal and malignant hematopoietic counterparts, as demonstrated by comparing AML M3 with the corresponding stage of promyelocytes (ID = G2). These differences were particularly evident for HOXA5, HOXA6, HOXA9, HOXA10 and HOXB4 (Figure 4). Similarly, differential expression of HOXA3, HOXA4, HOXA5, HOXA6, HOXA7, HOXA9, HOXA10, HOXB5 and HOXB6 distinguished leukemic cells of the M5a and M5b FAB subtypes from the matched normal counterparts, represented by the sorted M3 and M4 population, respectively (Additional file 8: Figure S7A and 7B). HOX gene expression patterns in corresponding differentiation stages of normal and malignat hematopoiesis. Comparison of HOX gene expression patterns between AML M3 and sorted subpopulation of healthy BM cells (ID = G2). In subpopulations of healthy BM cells, we analyzed the expression of chromatin modifying genes, previously shown to contribute to HOXA and HOXB regulation during embryogenesis ,,. Based on observed expression in the sorted subpopulations, the chromatin modifiers were divided into three groups. The first group, “Modifiers 1”, included genes that did not exhibit varying expression levels during differentiation (EZH2, BMI1, MLL, LSD1 and DNMT1). The second group, “Modifiers 2”, consisted of genes showing increased expression during hematopoiesis (JMJD3 and UTX). Expression levels of the third group, “Modifiers 3” (DNMT3a and DNMT3b), showed a decrease concomitant with differentiation, which were statistically inversely correlated with Modifiers 2 (R = −0.922; Figure 5A). However, we did not observe a clear pattern of corresponding HOX gene expression changes in these cells. Expression patterns of chromatin modifiers and HOX genes in subpopulations of healthy BM and AML cells. A. Subpopulations of healthy BM; B. AML patient subgroups. Lines connect values between categories (e.g., differentiation stages) to visually enhance depiction of trend across subgroups. 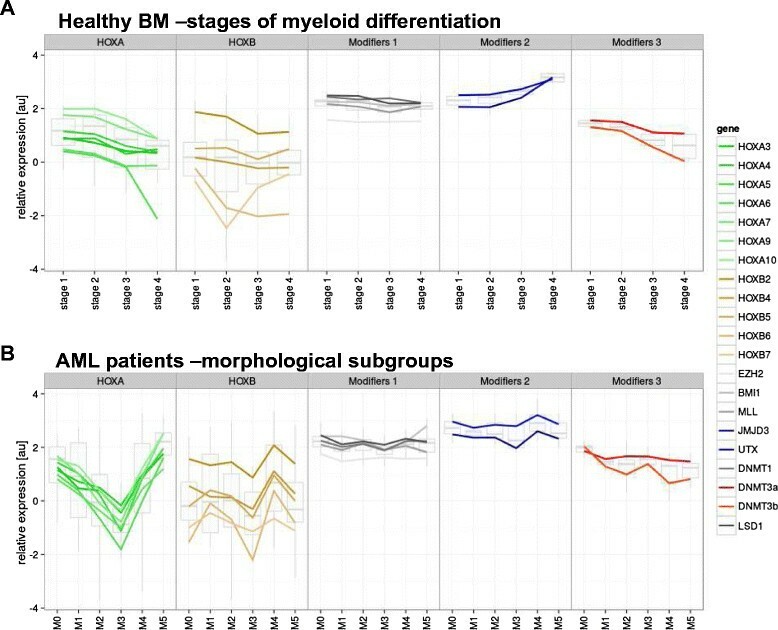 In leukemic cells, the expression of Modifier 1 genes, except for BMI1, paralleled their normal counterparts, being largely unchanged among the morphological AML subgroups. The expression of Modifier 2 and 3 genes markedly differed among AML samples (Figure 5B). In contrast to normal cells, the expression of Modifier 2 and 3 genes appeared to mirror the differences in HOX mRNA levels. In general, HOXB expression was positively correlated with Modifier 2 genes (e.g., H3K27 demethylases; R = 0.874). The correlation of HOXA gene expression levels with Modifiers 2 genes was less pronounced (R = 0.506) in all cases with the exception of the AML M3 subgroup. For the Modifier 3 genes (e.g., DNMTs), there was a substantial negative correlation with HOXB expression (R = −0.442; Figure 6). However, in contrast to normal hematopoiesis, the observed inverse correlation between Modifier 2 and 3 genes was much less pronounced (except for AML M3 and M4; R = −0.178; Figure 6). Relationship of expression patterns of chromatin modifiers and HOX genes in subpopulations of healthy BM and AML cells. Lines connect values between categories (e.g., differentiation stages) to visually enhance depiction of trend across subgroups. For individual genes in the leukemic samples (Additional file 9: Figure S8), there were several notable correlations. For instance, the expression of JMJD3 with HOXB4 and HOXB6 was strongly positively correlated (p = 0.0003 and 0.0012, respectively), while negatively correlated with DNMT3b (p = 0.03). There was also strong correlation on a one-to-one basis between genes in the HOXA cluster and for genes in the HOXB cluster. 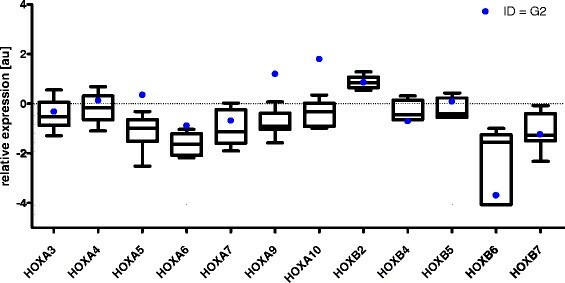 However, in contrast with the healthy samples, there was only a weak correlation between the particular HOX genes from different HOX clusters. Several reports have demonstrated that HOX genes are not only potent regulators of embryonic development but also play significant roles in the regulation of many processes in adult organisms, including hematopoiesis -. The overall role of HOX clusters in addition to that of particular HOX genes in hematopoiesis have been revealed by various knock-out and overexpression studies of human hematopoietic cells or by studies using mouse models -. However, the degree to which HOX genes contribute to the process of leukemogenesis has not yet been elucidated. The aberrant expression of HOX genes has been reported in the majority of leukemia patients. However, it remains unknown whether this aberrant expression represents a genuine driver of leukemogenesis or a passenger effect reflecting a differentiation block. Another possible explanation takes into consideration an impact of the molecular aberrations present in leukemic cells with further biological consequences. Here, we attempted to shed light on the expression of HOX genes in normal hematopoietic precursor cells versus their malignant counterparts with respect to their differentiation stage arrest in AML. The crucial prerequisite for such an analysis is the appropriate identification of subpopulations of healthy BM cells representing the stages of myelopoiesis that can be matched to their respective morphological counterparts in AML. We managed to sort these subpopulations and analyzed their HOX gene expression patterns. The expression of HOX genes was higher at the initial stages of hematopoiesis and gradually decreased with the maturation of the hematopoietic cells, supporting the generally accepted hypothesis that HOX genes are strong regulators of hematopoiesis (particularly at the early stages) . A comparison of matched normal and malignant hematopoietic precursor cells at the same differentiation stage demonstrated the distinct expression patterns of the HOX genes in the leukemic cells. This indicates that the aberrant patterns of HOX gene expression cannot be simply explained by the differentiation statuses at which the cells have been arrested. This is similar to what we previously observed in pediatric patients with ALL, who were found to exhibit differential HOX gene expression between the subgroups and their matched normal precursors according to differentiation stage . Altogether, our results support the hypothesis that the dysregulation of HOX genes is involved in the process of neoplastic transformation. The analysis of childhood AML patients revealed a different expression profile of HOX genes among the FAB subtypes and the subgroups of patients bearing unique molecular rearrangements. The most diverse subgroup of AML was AML M3, which showed the lowest levels of HOX gene expression. This subgroup is characterized by the presence of the PML-RARa fusion gene, which generates an aberrant retinoic acid receptor unresponsive to the physiological levels of this molecule. RUNX1-RUNX1T1+, CBFb-MYH11+ and MLL- rearranged AML patients also showed unique HOX gene expression patterns. MLL rearrangements have been previously shown to have a determinant role on HOX gene expression . Moreover, we revealed that AML patients bearing the PML-RARa fusion gene had low expression levels of the HOX genes regardless of FLT3/ITD status. This finding is even more interesting considering that FLT3/ITD has been shown to be associated with the upregulated expression of HOX genes in leukemia patients . Therefore, we performed an analysis of a larger cohort of AML patients  from Erasmus MC-Sophia Children’s Hospital and replicated the results drawn from our cohort of pediatric AML patients. This analysis showed that despite the overall upregulation of the HOX genes in FLT3/ITD+ AML patients, HOX gene expression in FLT3/ITD+ PML-RARa+ patients was significantly lower compared to the FLT3/ITD+ patients without this fusion protein. Therefore, in this case, the PML-RARa fusion gene may be superior to FLT3/ITD with respect to its role in the process of malignant transformation. Based on these results, we suggest that AML-specific fusion oncoproteins may impact the upstream pathways that deregulate the HOX genes, thereby acting as the major underlying factors of their characteristic expression patterns observed in leukemic cells. Our analysis of the AML patients also showed significantly lower expression levels of HOXA in the SR compared with the HR patients (in accordance with a previous study ). These results suggest that the assessment of HOX gene expression patterns may allow for the prediction of aggressive cases of leukemia and may therefore be taken into consideration in risk stratification. However, we suggest that this observation is a consequence of the allocation of patients with different molecular aberrations to particular AML risk groups (i.e., PML-RARa+ patients with the lowest HOXA gene expression levels being assigned to the SR group and MLL+ cases with the highest expression levels of HOXA genes being allocated to the HR group) and not an independent prognostic factor. 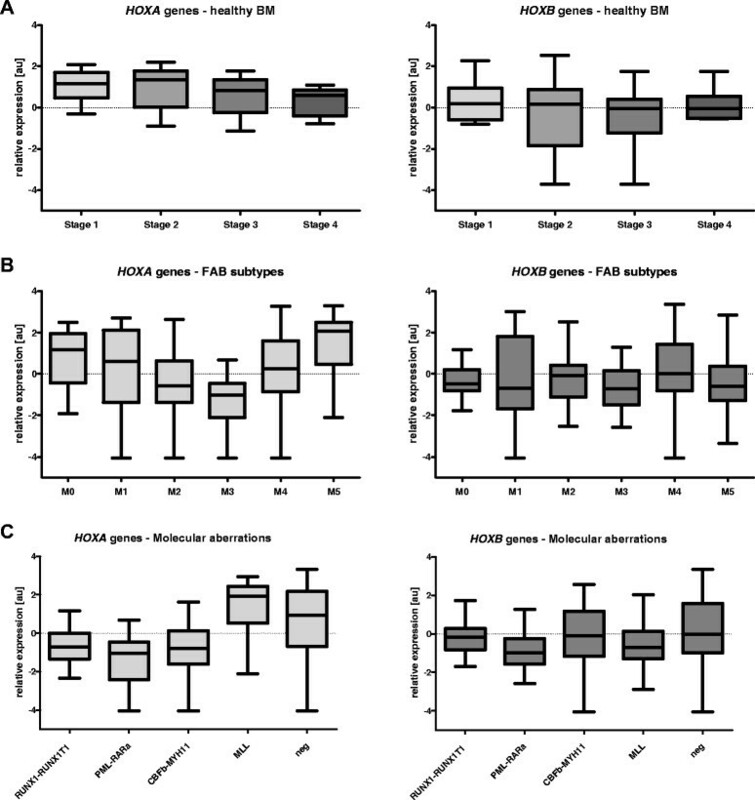 Considering the profound contribution of chromatin modifiers to the embryonic regulation of HOX genes and the essential roles of HOX genes in hematopoiesis, the dysregulation of chromatin modifiers may deregulate the entire process of hematopoiesis and subsequently lead to malignant transformation. However, the exact roles of epigenetic modifications in the regulation of leukemic HOX gene expression remain to be elucidated. It has recently been shown that HOX genes possess unique chromatin regions called bivalent domains. These domains are characterized by the presence of both repressive (methylated H3K27) and activating (methylated H3K4) histone methylation marks and are found in genes poised to be activated according to cell-specific requirements . To determine the role of chromatin modifiers in the regulation of HOX genes in normal hematopoiesis and leukemogenesis, we analyzed the expression patterns of DNA methyltransferases, histone H3K27/H3K4 demethylases, and selected PcG and TrxG genes in subpopulations of healthy BM cells and BM samples of patients with AML. We found an inverse correlation of histone demethylase (Modifiers 2) and DNMT (Modifiers 3) gene expression in normal and malignant hematopoiesis. In contrast to healthy hematopoiesis, we found an interesting correlation between chromatin modifier gene expression and that of the HOX genes in the AML samples. The most pronounced correlation was observed with the AML M3 subtype. The specific relationship of the HOX genes with the epigenetic modifiers in this morphological subgroup could be affected by the presence of the PML-RARa fusion gene. In particular, HOX gene expression was positively associated with the histone H3K27 demethylases, JMJD3 and UTX, and inversely correlated with DNMT3b. Notably, both JMJD3 and UTX have recently been suggested to play roles in hematopoiesis ,. Moreover, UTX has been shown to directly bind to the HOXB1 locus ,. Taken together, the results implicate chromatin modifiers in the establishment of the aberrant leukemic expression of HOX genes in pediatric AML patients. 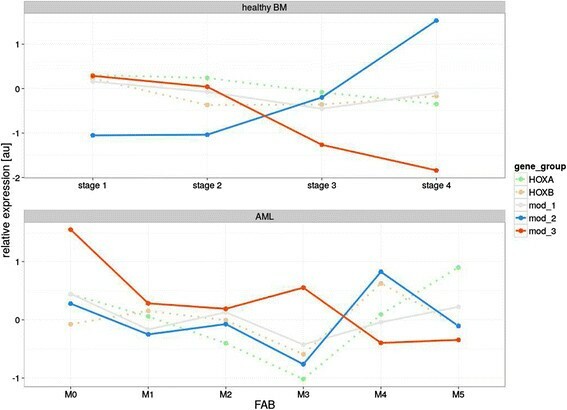 Although the expression of BMI1 was not altered during hematopoiesis, a Spearman correlation analysis showed that this gene was positively correlated with HOX gene expression in the leukemic samples. It has been reported that BMI1 determines the proliferating abilities of the cells by inhibiting the p16 gene. HOXA9 was also shown to target p16 and impair the senescence of cells . Thus, the expression levels of the histone methyltransferase BMI1 are likely to reflect the proliferation statuses of leukemic cells without directly impacting HOX gene expression . Interestingly, the PML-RARa and RUNX1-RUNX1T1 fusion oncogenes have been shown to cooperate with repressive complexes, leading to alterations in chromatin architecture. PML-RARa causes profound changes in the epigenetic landscape, mainly by recruiting chromatin-modifying enzymes to target sequences or by the deregulation of their functions ,. Furthermore, recent studies have shown that the degradation of the PML-RARa oncoprotein results in dramatic changes to the landscape of histone modifications . Similarly, RUNX1-RUNX1T1 has also been shown to recruit epigenetic modifiers to target sequences . These findings together with our data suggest that AML-specific oncoproteins regulate HOX gene expression through epigenetic modifications. However, further studies are needed to understand the roles of epigenetic modifiers in the regulation of normal as well as leukemic HOX gene expression and their cooperation with AML fusion oncoproteins. In summary, we found that the expression patterns of the HOX genes in leukemic cells are not solely determined by their particular differentiation stages. Conversely, we assume that the specific molecular aberrations that are typical of AML are the major determinants of the leukemic expression patterns of the HOX genes. Our results also demonstrate the differing contributions of epigenetic modifiers to HOX gene expression in healthy and malignant hematopoiesis. The authors would like to thank the staff of the Czech Pediatric Hematology Working Group (CPH) centers for their cooperation. We are also grateful to our technicians (especially Pavel Semerak) for their kind help with the sample processing. This work was supported by Grant Agency of Czech Republic P304/12/2214. KR was supported by Grant Agency of Charles University GAUK 568213. JaS was supported by the Project of Ministry of Health, Czech Republic for the conceptual development of research organizations 00064203 (University Hospital Motol, Prague, Czech Republic). We acknowledge the contribution of samples from AB and DR and the support of the DCOG (VdH) as shown in previous studies . KSK performed majority of the sample processing and analyses and wrote the manuscript. KR was responsible for the qPCR analyses, and KF performed the statistical analyses. EM defined the crucial characteristics of the sorted subpopulations of the healthy BM cells and designed all of the FACS sorting experiments. MZ was responsible for the molecular characterization of the AML patients. HD and JT revised the manuscript and provided critical intellectual feedback. JaS was responsible for the clinical management of the patients. As a senior author, JuS coordinated all of the experiments, revised the manuscript and is the principal investigator of the whole study. CMZ, MvdHE and MF contributed by providing datasets and performing the gene expression profiling analyses of the replication sets. All authors read and approved the final manuscript.